Newly promoted Cardiff City have completed their first signing since winning the Championship and moving up to the Premier League for the first time in their history. 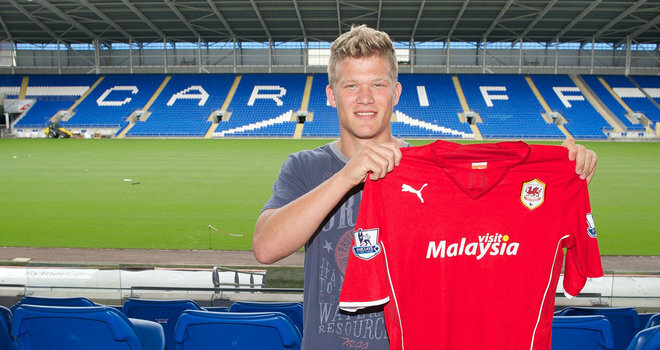 They have smashed their record transfer fee with the signing of Denmark international Andreas Cornelius in a deal believed to be worth £7.5 million. The previous record was the £4 million signing of Michael Chopra from Sunderland in 2010 but in a signal of their intent to remain in England’s top flight they have splashed the cash on the international striker. The 20-year-old scored 18 goals in 34 appearances last season for Danish side FC Copenhagen making him the top scorer in Superliga as the club won the league. Cornelius had been attracting attention from all over Europe, with Manchester United and Arsenal apparently holding an interest in the player but has ended any speculation by signing a five-year deal at the Welsh club. “This is a dream come true for me,” he told the club’s website. “I’ve been given a great opportunity and this is a very exciting project that’s taking place at Cardiff City,” he added. He passed his medical this morning (Monday) and will join up with his new team for preseason training straight away and will be hoping to impress in time for Cardiff’s opening game against away to West Ham United on the weekend of 17th August.